Explanation: On February 26th, it was dark during the day. 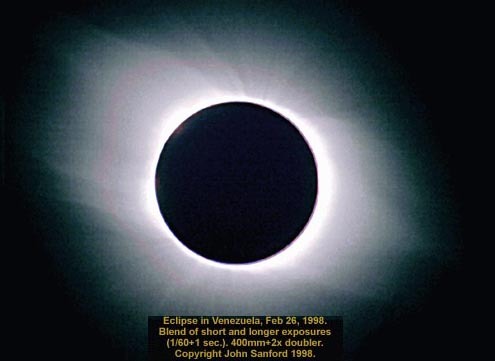 This total solar eclipse was the last visible from the Americas for this millennium. A total solar eclipse is exciting partly because it is so short. Were Earth's Moon farther away, no total eclipse would occur at all because the Moon would appear too small to block out all of the Sun. Were the Moon much closer to the Earth, the eclipse would last much longer. Oddly, the Sun and Moon have almost exactly the same angular size. Even for well located observers, this creates at most only a very few minutes of totality before the Moon's shadow moves away. During a total solar eclipse in 1919, these few minutes were long enough for scientists to determine that the Sun's gravity bends light from the stars behind it, dramatically confirming the accuracy of a new theory of gravity postulated over 80 years ago.